Post production or real time captioning for virtually all types of applications and media sources. Innovative extended audio description for accessible video that meets WCAG 2.0 standards. Provide subtitles and captions on an even wider range of devices and players. Reach international audiences and ensure accessibility compliance in additional languages. Professional transcription in as little as eight hours, without the error rates found in speech recognition and crowd-sourcing. Result review, DVD/MP4 Transfer, Copy Edit, video SEO, integration assistance, and more. CaptionSync by AST was developed more than 14 years ago, in collaboration with a team of expert advisors from higher education and with funding from a Small Business Innovation Research grant from the U.S. Department of Education. Today AST’s CaptionSync service is the leading video accessibility service for accuracy, cost-effectiveness, expertise and ease of use. Our Approach: Our team will work with you to understand your needs, then employ a smart balance of cutting edge automation technology and experienced professional transcribers to provide closed captions, transcripts, and video search capability, without the error rates found in speech recognition and crowd-sourcing solutions. The end result is a smarter captioning and video accessibility service. Benefits: Our transcripts, captions, and subtitles provide a multitude of benefits; the most important being accessibility, but also extra value benefits like in-video search, access to broader audiences, and improved learning outcomes. Whatever your goal may be, to educate, inform, or inspire, CaptionSync by AST will help you maximize the value of your video content. Accuracy: Our quality is guaranteed. With 99.5%+ professional accuracy right out of the gate, you’ll get ADA-compliant captions without the clean-up hassles associated with so-called “revolutionary” human-hybrid systems. Education Expertise: AST was built in collaboration with a team of education experts whose goal was to create a flexible service able to meet the rigorous needs of educational organizations. Our transcribers thrive on challenges like captioning complex STEM content. USA-Based: Our professional transcribers are based in the United States and produce top-quality results at an affordable cost, with better security and confidentiality than the off-shore captioning sweat-shops that are constantly spamming your inbox. Customer Service: As a self-funded company with no venture capital or corporate shareholder obligations, AST is able to serve you with your long-term interests in mind. Our team has a better understanding of customer needs, and is able tailor solutions for each customer. Compliance & Technical Expertise: With over 14 years of track record in the industry, AST has the knowledge and experience to offer expert advice and resources for both the compliance and technical aspects of video accessibility. Scalable: Customers can use CaptionSync on an as-needed basis, without volume commitments or contracts. Our services are also scalable for large volumes with fast turnaround times, with flexible account management and reporting features. 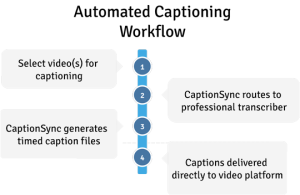 Easy Workflow: Using smart automation our CaptionSync service seamlessly integrates with existing workflows and accelerates the captioning process. This saves your staff time, and also allows us to stay competitively-priced without sacrificing quality. Value: AST offers many free tools including our CaptionSync Smart Player, which leverages interactive and searchable transcripts following UDL principles. We also offer other cost-saving features, such as the ability to download multiple captioning formats at no additional cost. Whether you’re an instructional designer creating accessible courses, a video producer juggling multiple projects, or a CIO looking for a scalable organization-wide captioning and subtitling solution, we have the resources you need to learn exactly how to caption your videos and why. Leading organizations rely on us. And more than 7,000 others, for over 14 years. We know that captioning can seem complex at first, but we’re here to help. Please call us at (877) 278-7962 or initiate a chat if you have any questions. If you’re ready to create an account, click get started and we’ll walk you through the next steps.